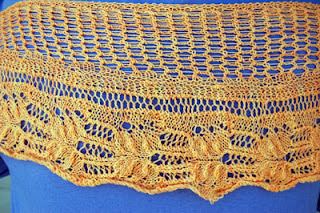 Ivy Brambles Frost Flower Shawlette by Jocre Arts is pretty, bright and cheerful. The Frost Flowers Shawlette knits up quickly in Ivy Brambles super soft Romantica lace yarn. This elegant shawlette features a trellis with frost flowers design sweeping across adding beauty and may be worn across the shoulders on a cool evening, or as a scarf under a warm jacket. 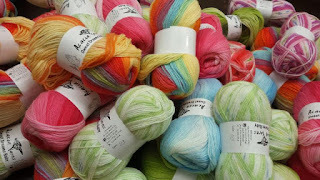 Ivy Brambles Romantica yarn comes in a variety of semisolid and variegated colorways and has just been restocked! Each skein is a generous 1000 yards of this wonderfully soft superwash merino yarn.